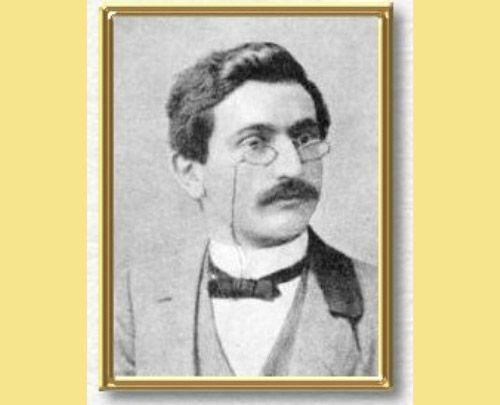 Emanuel Lasker was born in Berlinchen, Germany on 24th December, 1868. He was taught chess by his elder brother, Berthold. As a child Lasker displayed a talent for both chess and mathematics. He attended a school in Berlin to develop his mathematical skills further and he later went on to study mathematics at Erlangen University. He achieved the German master title in 1889. In 1892 he won his first important success in a small but strong tournament in London when he took first place a half a point ahead of Blackburne. Lasker then played a match against Blackburne and when he won decisively he began to think of the possibility of becoming world champion. He challenged Tarrasch but his challenge was declined. Lasker told him that he should first win a major tournament. Lasker then went to the USA to challenge the ageing Steinitz for the world championship. The match took place in 1894. Like the previous Steinitz vs. Zukertort match the games were to take place at three venues; New York, Philadelphia and Montreal. The man to achieve 10 outright wins would be world champion. The first six games of the match was closely fought with each man winning two games and drawing two games. Then Lasker went on to win the next two games. In Philadelphia Steinitz lost all of the games. Lasker became world champion at the age of 25 in Montreal with a score of ten games to five with four games drawn. Lasker was to retain the world champion title for a record 27 years. "In my opinion the match with Steinitz does not have the great importance that they themselves attribute to it. For Steinitz has grown old, and the old Steinitz is no longer the Steinitz of old." Also the fact that Lasker had never won any major tournaments before this date did not make his claim of world champion any easier. This prompted Tarrasch, who had the best tournament record at this time, request a separate title of "World Tournament Champion". The tournament was to take place in Hastings in 1895. It was believed that the victor would be either Lasker, Tarrasch or Steinitz. However, a major upset occurred when Harry Nelson Pillsbury, an American playing in his first major tournament, won instead leaving the issue of world champion undecided. Later in the year the top five winners of the Hastings tournament, Pillsbury, Tchigorin, Lasker, Tarrasch and Steinitz were invited to play in a tournament in St. Petersburg to resolve the matter. Tarrasch, however, was unable to attend due to professional commitments. The tournament in St. Petersburg consisted of eighteen rounds with each player playing his rival six times. Lasker emerged clear winner by two points and Steinitz took second place. At the rematch for the world championship in Moscow in 1896 Lasker beat Steinitz with a score of ten wins to two with five draws. Lasker's excellent results left no one in any doubt as to who was the real world champion. Lasker always demanded large appearance fees for his matches. He had witnessed former world champion, Steinitz and other players end up poverty-stricken and wanted to make things better for future chess players. However, despite his efforts chess masters were still dying in poverty. This cause him to become disillusioned with the game and in 1920, after agreeing to defend his title against Capablanca, he decided that his heart was not really in it and resigned without the match taking place. However, the chess world would not allow this to happen and in 1921 the match went ahead. After 14 games Lasker resigned on the grounds of ill health and returned to Europe prepared to retire from chess for good. Chess was never Lasker's main career and throughout his world champion reign he actively pursued his other interests in mathematics and philosophy. After the World Championship match he returned to his academic interests and played bridge to international level. However, after two years he returned to chess only to retired again in 1925. During the war the Nazis forced him to flee Germany, leaving his property and money behind him. He was now penniless. In 1934, at the age of 65, he needed to return to chess for financial security. He demonstrated that even when he was elderly he could still play great chess. He finally made his home in New York and died in 1941 at the age of 72. Περισσότερα >> Δωδέκατη σελίδα - Παρατηρητήριο - Απόψεις.